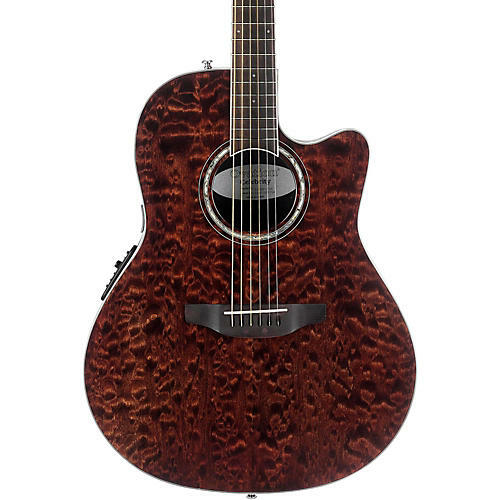 The Celebrity Standard Plus series is your first step into the world of Ovation, with select figured tops, beautiful abalone appointments and first-rate sound, features and value. 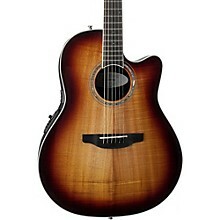 This CS28P-KOAB Celebrity Standard Plus guitar has the classic Super Shallow bowl Lyrachord cutaway body with a striking figured koa top featuring quarter sawn scalloped “X” bracing. Ovation reviewed their earlier bracing patterns extensively to arrive at this remarkable enhanced design, which borrows from the past and is voiced for the present with natural tone and optimal response and power. Together, the body and top create the classic Ovation sound, resonating with full projection, remarkable note clarity and balance, and nuanced tonal complexity. The figured koa top also has an elegant abalone rosette, ivory white binding and beautiful natural gloss finish. Other premium features include an effortlessly playable neck with a natural satin finish and rosewood-veneer headstock, 20-fret bound rosewood fretboard with abalone microdot inlays, and a rosewood bridge. For great live sound, the CS28P-KOAB features an Ovation Slimline pickup and OP-4BT preamp system with three-band EQ, volume/gain control, onboard tuner and low-battery light. Case sold separately. Bracing pattern: Quartersawn Scalloped "X"